This was a particularly strong category this year with excellent entries from Royal Commission Yanbu Colleges & Institutes and Miele with CEVA Logistics. However, there were two entries that stood out. 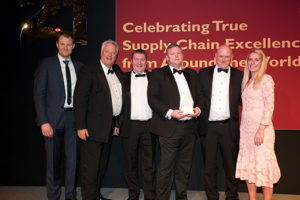 Kurt Schilders, director supply chain, Telenet, Chris Leigh-Browne, Senior Vice President, Business Development, CEVA Logistics, Brent Stuart, Senior General Manager, CEVA Logistics, Danny Brown, Vice President CEVA Ground, CEVA Logistics, Julian Money, General Manager, CEVA Logistics and Sara Pascoe. New Look, in cooperation with its logistics provider Clipper Logistics, developed training to help ensure the highest levels of safety in the logistics process. The initiative focuses on the training of Clipper’s drivers but the benefits can be felt throughout the organisation. But it was up against British Gypsum with CEVA Logistics. The partnership has driven a safety culture by encompassing a number of things, including innovation and procurement, driver training, and external safety programmes. CEVA delivers more than 50,000 full loads every year, using a combination of dedicated fleet and contractors. The project has focused on three areas: increasing coupling/uncoupling compliance, improving driver behaviour and achieving FORS Gold status. The judges decided this was the winning entry, with a Highly Commended for New Look with Clipper.